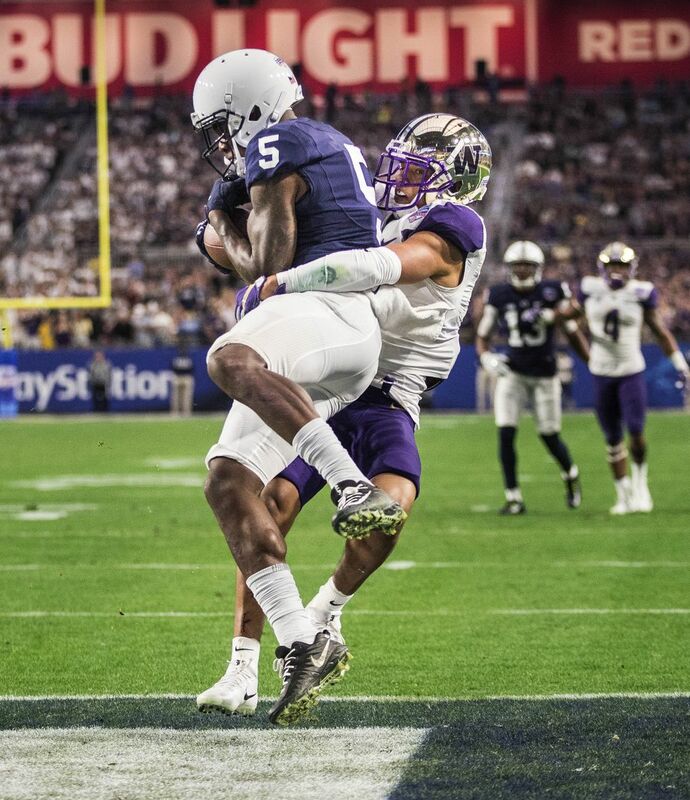 Washington's top-ranked run defense allowed as many yards on one play as it had averaged all season, then Penn State added 100 more as the Nittany Lions ended the Huskies' season with a Fiesta Bowl loss. GLENDALE, Ariz. — Myles Gaskin had just slipped off his shoulder pads, and his spikes, when he began a slow walk out of the Washington locker room and down a dark corridor deep inside University of Phoenix Stadium. Gaskin was ornery, and he wasn’t alone. As they made the 100-yard walk, Gaskin in white socks and white tank top, Jake Browning still in full uniform, the quarterback extended his left arm and placed it around the running back’s shoulders. Before they would reach a news conference podium to talk about the Huskies’ 35-28 loss to Penn State in the Fiesta Bowl, Browning first talked his running back off the ledge. Yes, it was an emotional ending for the Huskies (10-3) on Saturday afternoon. Emotional for a senior class that helped build a foundational bridge from one coaching regime to the next. Emotional for a fan base yearning for the program’s first major bowl win in nearly two decades. Emotional to close a promising season in defeat. And emotional, too, for two backfield friends who may be nearing a formal goodbye. During their walk to the news conference, Browning broached the idea of the future — the future of the Huskies’ offense and Gaskin’s place in it. Browning wasn’t going to let his running back slip away without a word. Gaskin acknowledged he is “on the fence” about whether he will enter the NFL draft or return for his senior season in 2018. With him, the Huskies will likely be one of the favorites — if not the favorite — again in the Pac-12 Conference title chase next fall. With him Saturday afternoon, the Huskies nearly pulled off a dramatic comeback against Penn State. It was Gaskin’s 69-yard touchdown run with 6:52 remaining that cut the Huskies’ deficit 35-28 and suddenly offered hope of a late rally. Up to that point, Penn State (11-2) had largely been in control, building a 28-7 lead early in the second quarter and carving up the Washington defense in a way no offense had the past three seasons. That continued on Penn State’s final possession. After Gaskin’s long TD run, the Nittany Lions held the ball for the next 6 minutes, 13 seconds, driving 47 yards on 13 plays. Penn State would close that drive by missing a 45-yard field-goal attempt, but that still only gave the Huskies — with no timeouts — 34 seconds to drive 72 yards. Browning’s first three passes from the UW 28-yard line fell incomplete. His fourth, with 15 seconds left, was complete in the middle of the field to Aaron Fuller, who then flipped it to teammate Dante Pettis running toward the right sideline — a hook-and-lateral play. Pettis, trying to keep the play alive as he ran near the Penn State sideline, turned, jumped and threw back toward the middle of the field, trying to keep the play alive. Except, Pettis’ lateral went directly to Penn State linebacker Brandon Smith, who corralled the ball and then dropped to the ground with five seconds left. Game over. UW’s defense wasn’t at its best. The Huskies came into the game with the nation’s No. 1 rushing defense, allowing 92.3 yards per game. 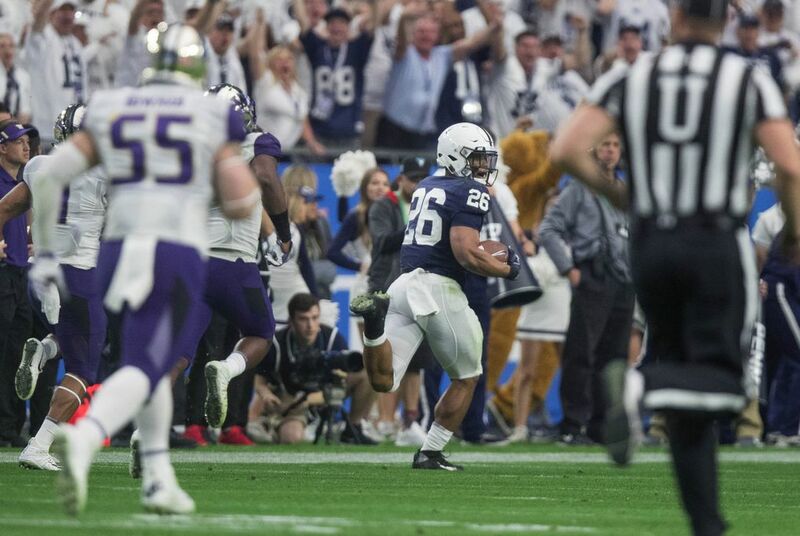 “We got that in one play,” said Penn State star Saquon Barkley, whose 92-yard touchdown run gave the Nittany Lions their 21-point lead in the second quarter. It was the longest run in Fiesta Bowl history. 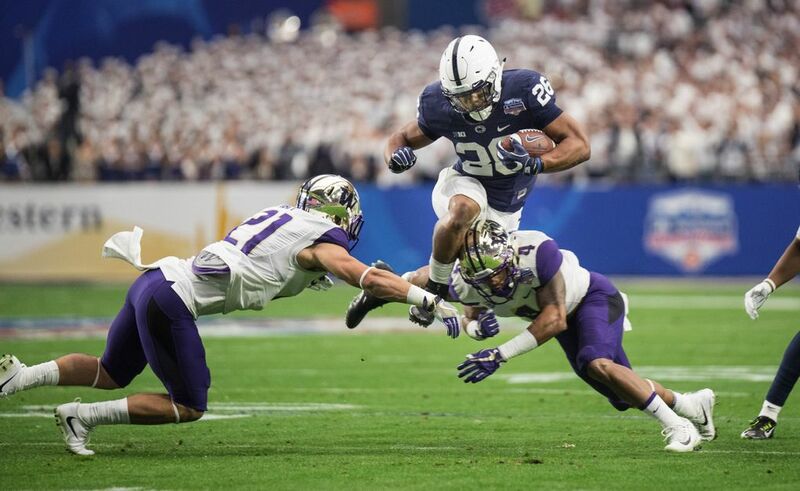 Barkley, a potential top-five pick in the NFL draft, had 137 yards and two touchdowns on 18 carries. The Huskies had even more difficulty containing Trace McSorley, Penn State’s slippery dual-threat QB who threw for 342 yards and ran for 60 more. Incredibly, Penn State converted 10 of its first 11 third downs, and 13 of 17 overall, finishing with 545 yards of total offense. That’s the most yards the UW defense has allowed since October 2014 (vs. Oregon). “Flat-out miserable,” UW coach Chris Petersen said, summing up his emotions after the game. “But it is what it is. It’s a good football team we played out there. It is, it really is. They had us on our heels most of the night. Even with the loss, the Huskies — now 1-3 under Petersen in bowl games — will carry expectations of a return to a major bowl game next season. A dedicated senior class is on its way out, as is junior defensive tackle Vita Vea — he’s off to the NFL — but with or without Gaskin, there will be great anticipation for 2018. “Honestly,” senior linebacker Keishawn Bierria said, “I think this team is going to be way better next year. Defense, offense, guys are going to grow. We’ve got a bunch of guys coming back. The Pac-12’s 1-8 record in bowl games this year is the worst in college football history by a Power-5 conference (minimum five games).